Ottawa (VNA) – Nem ran (crispy spring rolls), which has been listed among the top 10 best dishes by CNN Travel, has been introduced to foreign friends during the ASEAN Happy Hour programme as part of the Ottawa Travel and Vacation Show in Canada. Together with the traditional dish, the Vietnamese Embassy in Canada gave visitors an insight of thousand-year-old Hanoi city, the beauty of the UNESCO-recognised World Heritage Sites of Ha Long Bay and Phong Nha-Ke Bang. 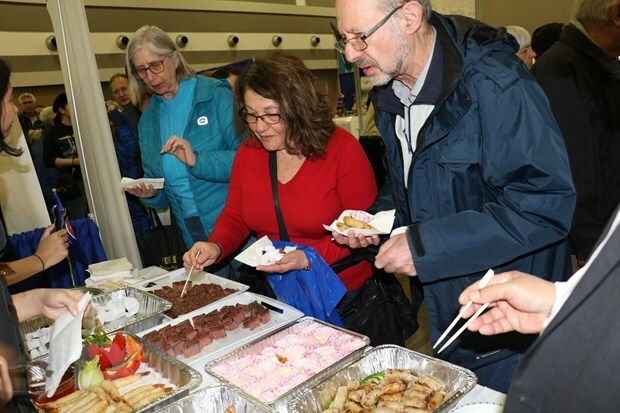 The Ottawa Travel and Vacation Show, took place on March 30 and 31, had more than 200 booths organized by more than 50 countries around the world. 2018 was a successful year for Canada’s tourism sector with 21.13 million tourists visiting the country in the year. Tourism created 745,300 jobs in Canada, and contributed about 102.5 billion CAD (76.78 billion USD) to the country’s economy. According to Jay Johnson, Sales and Marketing Director of Come&Go Vietnam, Vietnam and Canada boast high potential for cooperation in tourism. Canadian people consider Vietnam as a safe destination to visit, he said.